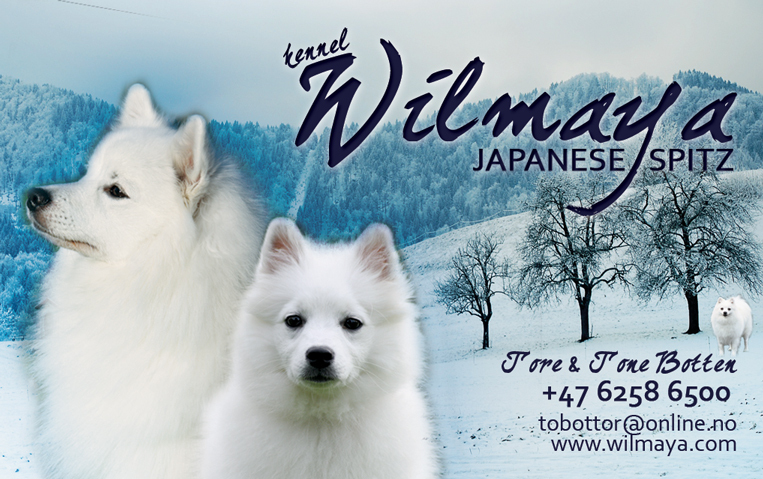 Kennel Wilmaya is breeding the wonderful breed Japanese Spitz. We got our first Japanese Spitz in 2007 (Wilma). Our first litter was born in April 2009, and one puppy stayed here. (Maja) We got our kennel prefix autumn 2009. At the moment we are having 3 females and 1 male here at home. The dogs are a big part of our daily life. We are spending lots of time with them in training, walks, cuddling, and dog activities as shows and agility. Dogshows are very exciting, and we are often taking our dogs to shows. We live in Stange (in the east of Norway), only 1,5 hours away from Oslo and only 1 hour away from Oslo Airport Gardermoen. The Japanese Spitz is happy, smart and beautiful - We love the breed! Hope you enjoy our website. If you have questions or are interested in puppies/planned litters please contact us. You are very welcome to leave a message in the guestbook before you leave.